Dr. Amrith Rohan Perera is a Graduate of Law of the University of Ceylon (1971). After being admitted as an Advocate of the Supreme Court (1973), he practiced in the field of Civil Law. He then joined the Ministry of Foreign Affairs as an Assistant Legal Advisor (1976). Thereafter, he was appointed an Additional Legal Advisor and finally Legal Advisor. He served until his retirement from public service in 2007 as the Legal Advisor. Thereafter he continued to serve the Ministry of Foreign Affairs in an advisory capacity. 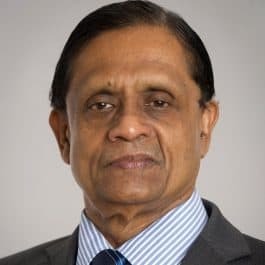 During a career spanning a period of over thirty years in the Ministry of Foreign Affairs, Dr. Perera has been closely associated in bi-lateral, regional and multilateral spheres, particularly in the field of treaty negotiations. During this period he has been a member of the Sri Lanka delegation to the UNGA and functioned as Alternative Representative to the Sixth (Legal) Committee. He has also represented Sri Lanka at Meetings of the Commonwealth and SAARC. Until 2011, Dr. Perera served a member of the International Law Commission (ILC), having been elected to the Commission by the General Assembly of the United Nations in 2007. At its 63rd Session, Dr. Perera was elected the General Rapporteur by the Commission. He also chairs the United Nations Ad-hoc Committee on Measures to Eliminate International Terrorism, established by UNGA Resolution 51/210, which is currently negotiating the Comprehensive Convention on International Terrorism. At the Golden Jubilee Session of the Asian African Legal Consultative Organization (AALCO) Dr. Perera was unanimously elected the Chairperson of the Eminent Persons Group (EPG) constituted to advise the Secretary-General on the future work programme of AALCO. Dr. Perera also served as a Consultant to the Commonwealth Secretariat on issues relating to terrorism and money laundering. In May, 2010 Dr. Perera was appointed as a Commissioner of the Lessons Learnt and Reconciliation Commission (LLRC). The Commission was vested with powers to make recommendations, inter alia, on promoting national Unity and reconciliation in Sri Lanka, in the post-conflict phase. Dr. Perera has been serving as Sri Lanka’s Ambassador and Permanent Representative to the United Nations in New York since April 2015. Ambassador Perera has been elected as a Vice-President of the United Nations General Assembly to represent the Asia and Pacific Group during the 72nd Session (current of the UNGA. Dr. Perera is an Associate Member of the – Institute of International Law (Institut de Droit international), Geneva, Switzerland. Dr. Perera has recently been invited to contribute a chapter on the practice of UN Treaty-Making under the title ‘Treaties concerning Terrorism’ in the first ever Oxford Handbook of United Nations Treaties, to be published by the Oxford University Press in 2017. He has also been invited to contribute a chapter on ‘Sri Lanka’ for the 12 forthcoming publication ‘Oxford Handbook on International Law in Asia and the Pacific’ to be published by the Oxford University Press in 2017.